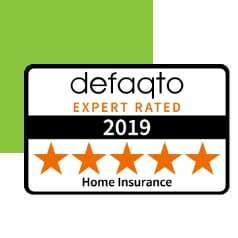 The HomeProtect home insurance policy has been benchmarked by Defaqto against other UK home insurance products available and awarded the highest possible Star Rating. This means that the policy provides quality cover and includes a comprehensive range of features and benefits, in fact one of the highest quality offerings in the market. Defaqto Star ratings show the quality and comprehensiveness of features and benefits of financial product on a scale of 1 Star (low) to 5 Stars (high). What does a 5 Star Rating mean? According to Defaqto, products with 5 Star Ratings, “Represent one of the best quality offerings in the market,” in terms of feature quality and comprehensiveness. Who or what is Defaqto? Defaqto is an independent organisation that provides customers with financial information designed to help them make better informed decisions. Why is a good Defaqto Star Rating important? Defaqto Star Ratings help you to make informed decisions about getting the appropriate cover to suit your needs. An insurance policy with a 5 Star Rating gives you the reassurance that you’re buying a high quality product that will protect you when you need it most. Great level of cover at a reasonable price, with a reputable company! 12 months guarantee on all repairs completed, as a result of a claim. Up to £750 for replacing security features folloring theft of keys. Up to £30,000 for alternative accommodation in the event of your property being uninhabitable (if you have Buildings cover with us). Up to £1,000 to cover visitors' belongings. Up to £1,500 to cover plants in the garden...and more!